Did Nostradamus predict the WTC disaster? The renowned prophet Nostradamus (Michel de Nostradame) was born on December 14, 1503 in St. Remy, Provence, France. 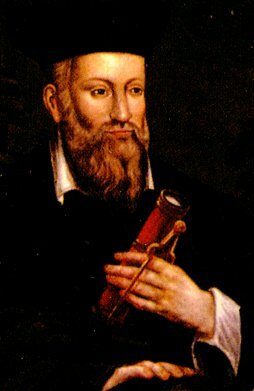 Nostradamus came from a long line of Jewish doctors and scholars. His family had converted from Judaism to Christianity in 1502, as a result of persecution on the ascension of Louis the XII. After a classical education he studied medicine, herbalism and astrology. During Nostradamus' lifetime the Black Death (today known as the bubonic plague) wiped out over a quarter of Europe. It is no wonder that a sense of apocalyptic terror fills Nostradamus' quatrains. Nostradamus can indisputably be said to have been ahead of his time, at least in terms of medical practice. His treatment of the Black Death involved removal of the infected corpses, fresh air and unpolluted water for the healthy, a herbal preparation rich in Vitamin C, and (in contravention of contemporary medical practise) not bleeding his patients. Nostradamus was successful in lessening the impact of the Black Death in the capital of Provence, Aix. The grateful citizens gave him a stipend for life. Nostradamus began to write his prophetic verses in the city of Salon, in 1554. 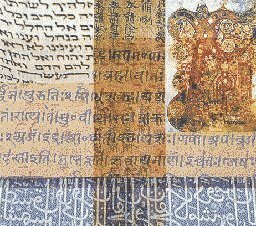 They are divided into ten sections called Centuries (which refers to the number of verses in each section, not to a unit of 100 years). The Centuries were published in 1555 and 1558, and have been in print continuously ever since. Nostradamus had the visions which he later recorded in verse while staring into water or flame late at night, sometimes aided by herbal stimulants, while sitting on a brass tripod. The resulting quatrains (four line verses) are oblique and elliptical, and use puns, anagrams and allegorical imagery. Most of the quatrains are open to multiple interpretations, and some make no sense whatsoever. Some of them are chilling, literal descriptions of events, giving specific or near-specific names, geographic locations, astrological configurations, and sometimes actual dates. It is this quality of both vagueness and specificity which allows each new generation to reinterpret Nostradamus. Nostradamus is said to have predicted his own death. When his assistant wished him goodnight on July 1, 1566, Nostradamus reputedly pronounced, "You will not find me alive at sunrise." He was found dead on July 2, 1566. Nostradamus was interred standing upright in the Church of the Cordeliers of Salon. However, his story does not end there; he was disinterred twice, once on purpose and once maliciously. In 1700, his body was moved by the city to a more prominent crypt. When a necklace was found on his skeleton bearing the date '1700', his body was hurriedly reinterred. During the French Revolution, in 1791, some drunken soldiers broke into his tomb. The mayor quickly placated the mob by describing how Nostradamus had predicted the revolution, and they replaced the bones in the crypt. Reputedly, the soldiers who desecrated his tomb for the final time were ambushed on their way back to base and killed to the last man. Stricly speaking, the copyright status of the content in the 'Prophecies of Nostradamus' section is unknown (particularly the English version). The files used to create this section have appeared at several other sites on the Internet. The copyright for the text on this page and the arragement of this material is governed by the copyright message which can be found by following the link at the start of this paragraph. The Charles Ward and Lee McCann books are in the public domain in the US. With the ISTA FLASH-DRIVE 9.0 you hold the world's wisdom in the palm of your hand - the most comprehensive collection of books on religion, mythology, folklore and the esoteric ever assembled....an incredible value with over 1700 books. Buy it here.